One of the negatives is the sore right knee of right-hander and No. 1 draft choice Homer Bailey, who had an operation on the knee last year. He did throw on the side before the game. Powell thinks he will be ready for his next start Friday. UPDATE: (Chad) I can’t find the article online, either. I’ll keep searching. I hope the Reds draft another high school pitcher in this year’s draft! Seriously…at least it isn’t his arm. I’ll start worrying when we start hearing about the Ty Howington/Chris Gruler arm trouble. Anyone checked on the players Billy Beane mocked in “Moneyball” lately? J. Bonderman…..S. Kazmir…..etc? It is hip to bash the drafting of high school pitchers currently. It certainly is not without its risks, certainly. 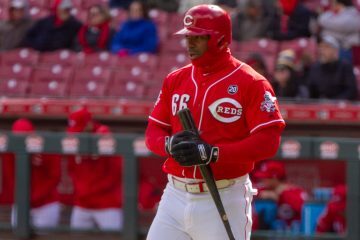 What would the Yankees/Red Sox have done given the Reds choice and the availability of Homer? How are college sluggers Chad Mottola and Brandon Larson working out? Taking college sluggers with their metal bat numbers is a risky endevor IMO, almost as risky as HS arms, for every Bonderman there are 10 Brien Taylors. 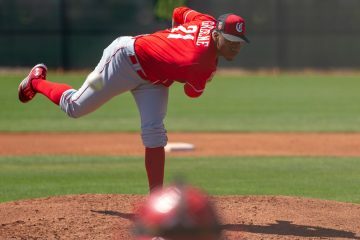 A team like the Reds needs to leverage their pitching growth for awhile in college arms… simply because they tend to have beaten a developmental curve. They are older have more milage on their arms and the cost of this development has been absorbed by the college. Meanwhile every Reds HS arm must be paid for and developed from scratch, meaning alot of time rehabbing the ineviable arm maladies. The history of Gary Nolan is enough to show me what a godd HS arm can do as well as how bad it can implode on you too. Kazmir is still an unpolished jewel (pitching tonight) his motion is a violent non uniform thing to behold ( as his Wagners) his future might find him in the BP or with his elbow in a bucket of ice. I agree that college arms are generally a better risk on draft day. Here is the current active win leaders. 17 have no college experience.